« Happy Birthday, Charles Darwin! OK, so the prize for weirdest political moment this week goes to the tag team of Gordon Brown and David Cameron, disagreeing in public over the age of Titian when he died. In what in itself is a revealing moment of bizarre self-conception, Brown apparently compared himself to Titian last month, saying the master did his best work in his last years, before dying at 90. Today, Cameron then rather pedantically stepped in at Prime Minister’s Questions in the House of Commons, presumably after having his people check the glaringly faulty Wikipedia entry, to correct the prime minister, who “never gets his facts right”, stating that Titian did, in fact, die at 86. Never mind that no one knows when exactly Titian was born and therefore at what age he died, it gets better: Shortly thereafter, an IP registered to Tory HQ doctored the same Wikipedia entry to back up his boss’ “zinger,” but only with limited success: not only did the person in question manage to get the one fact we do know about Titian’s lifespan — that he died in 1576 — wrong, changing it to 1572, he also failed to doctor the birth date correctly, landing Titian’s RIP at age 82. Scholarly consensus today tends to place Titian’s year of birth between 1488-90, meaning he probably lived to be between 86 and 88, give or take a few years. But really, we can all play this numbers game — the really silly thing is Cameron’s statement that Titian did his best work in his last years. Yes, the master was full of vigour in his old age and his late work is fantastic, but so is the rest of his oeuvre. His youthful work is fully as amazing as that of his last years, for example, and there is not even an institutional consensus about what “period” is his best that can be condensed to this kind of one-liner. To be sure, Titian had his weaker moments, but he is one of those artists who kept renewing himself, endlessly inquiring, a constant fire. I kind of wish I were living in a parallel universe, where Cameron had brought up that point instead. That would be an awesome parallel universe. 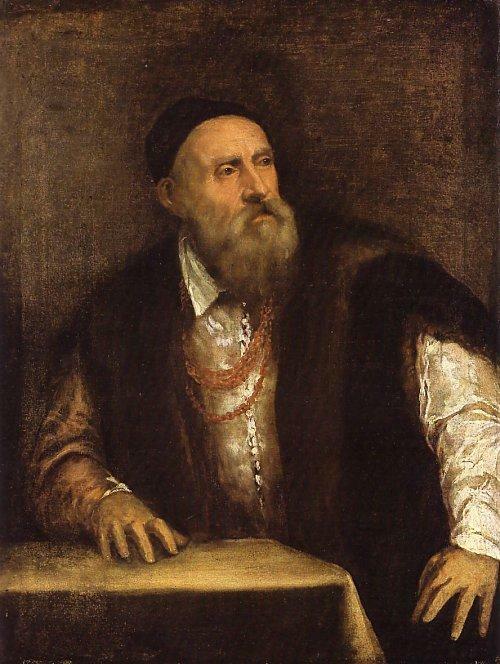 Above: Titian at age ?? — who knows? It’s probably from the late 1550s or early 1560s, and it’s in Berlin. Titian, with his hand on the blank canvas of the tablecloth.